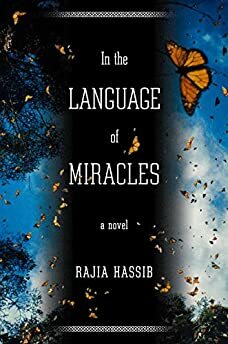 Largehearted Boy: Book Notes - Rajia Hassib "In the Language of Miracles"
Book Notes - Rajia Hassib "In the Language of Miracles"
Rajia Hassib's novel In the Language of Miracles is an insightful debut novel about family and grief. "Assured and beautifully crafted. . . . Hassib is a natural, graceful writer with a keen eye for cultural difference. . . . [She] handles the anatomy of grief with great delicacy. . . . In the Language of Miracles should find a large and eager readership. For the beauty of the writing alone, Hassib deserves it." I don't write to music, mainly because music, even if playing softly in the background, ultimately ends up distracting me, pulling me away from the writing to listen and eventually breaking my train of thought. But I do love a wide variety of music, from classical to pop and almost everything in between, and, as my list will show, I get obsessed with lyrics. With that in mind, here is a list of songs that I chose to match certain characters, relationships, or scenes in my novel, taking both music and lyrics in consideration. Simon and Garfunkel's songs often sound like compact, musical short stories. Their lyrics feature such compelling details, and many songs, including "America," even have dialogue embedded in them. What I find most fascinating about the lyrics of this particular song is that the speaker has "come to look for America" even though his initial point of origin is Saginaw, Michigan. This highlights the notion of America as an ideal, not just a geographical destination, and makes this song distinctly about the American Dream. That all the cars "on the New Jersey Turnpike" have come "to look for America" makes this a perfect song to play in the background during that first car ride that Samir and Nagla take from the airport—even though they were listening to Om Kalthoum, not to Simon and Garfunkel. The icing on the cake? The speaker's proclamation that he's "lost . . . empty and aching and [doesn't] know why." Food for thought. What's a better companion to "America" than a song about how "time took our dreams away"? If "America" represents the Al-Menshawys' arrival to the U.S., "High Hopes" can very well speak of their state at the novel's present time, more than two decades later. Additionally, the theme of communication (and lack thereof) that runs through The Division Bell makes it the perfect album to represent the entire Al-Menshawy family. "High Hopes" is especially poignant because of the underlying sadness of the song as well as the beautiful music. Between David Gilmore's lap steel guitar solo and that haunting bell sound ringing in the distance, this song is the perfect representation of what Samir and Nagla hoped to have—and what they ended up losing. I love Tracy Chapman's voice, lyrics, and music, so I had to include one of her songs, and I specifically wanted to choose one to represent some aspect of Ehsan's personality—such a difficult character to match to western music. "Telling Stories" suits her so well: there is the theme of telling stories in order to improve one's life (something that Ehsan literally tells Nagla in the novel), the possibility that those stories will eventually come between you and those around you, and, of course, that last line—"Sometimes a lie is the best thing"—which Ehsan would definitely agree with. I also love that the song is relatively upbeat, despite the lyrics—which suits Ehsan, who, faults and troubles notwithstanding, never struck me as a melancholy figure. Finally: Extra points for the song's metafictional possibilities. Matchbox 20 is one of the few bands actually mentioned by name in the novel, and since I specifically said that Khaled liked to listen to them, I wanted to include one of their songs—and what's a more suitable choice than "Unwell"? The lyrics fit Khaled perfectly. I can see him walking beside Brittany, wanting to share his troubles with her but afraid of her potential judgment of him, with "Unwell" playing in the background. Added kudos for including the following lines: "Dodging glances on the train/ And I know, I know they've all been talking about me/ I can hear them whisper/ and it makes me think there must be something wrong with me." I love Adele's voice. I would happily listen to her sing her shopping list. So it's a real pleasure to me that, in addition to her powerful, pulls-at-your-heartstrings voice, she writes wonderful, complex, multilayered lyrics. "He Won't Go," with its examination of a love that does not fit the romantic stereotype but that, still, has to qualify as love, is a perfect representation of the relationship between Nagla and Samir. That tension between knowing that leaving is a viable, perhaps even logical option, and yet choosing to stay, is one of the defining aspects of their relationship. And, because I do fixate on lyrics that clearly describe my characters, there is this: "I heard his voice today/ I didn't know a single word he said/ not one resemblance to the man I met/ just a vacant broken boy instead." Which makes this song the soundtrack to chapters eleven and nineteen. This is one of the most haunting songs I know. It's made all the more powerful by the simple lyrics, the beautiful music, and that jump from slow to fast to slow again. Anyone who has experienced the loss of a loved one has to appreciate the lyrics: "Those who are dead are not dead they're just living in my head." Spot on. The repetition and internal rhyme give it the air of a mantra or a lullaby, making the lyrics strangely hypnotic. This is what I imagine is going on in Nagla's head all the time she is up in the attic. Even though this song was originally written to depict a dying sheriff's last moments, its simple, repetitive chorus (and lyrics and music, for that matter—the entire song is apparently played with only four chords) has made it reach out well beyond its original intended meaning. For me, it's the perfect song for Samir. The idea of "knockin' on heaven's door" implies so much, including that the one doing the knocking feels close to death (either literally or metaphorically) and, more important, that the entry to heaven is not granted. He could very well be turned away. That suspension between hope and despair is, to me, the best representation of Samir's state, and the weariness and exhaustion that the music implies also fit him so well. This one was a tough choice. "Anger" is the 1st draft of a song called "Deliver Me," and both songs were included in the deluxe edition of Def Leppard's album, Slang, when they re-released it in 2014. Here is my problem: First, as a writer obsessed with revision, I hate to favor an early draft of anything over the later drafts, although, in this case, I hope Def Leppard forgives me since they did include both versions in their album. Second, as a former creative writing instructor who spent a considerable amount of time preaching about how concrete details are better than abstractions, I now feel like a fraud for choosing the lyrics, "Anger/ I'm feeling so much anger," over the revised version, which, to be honest, does feature better lyrics in the chorus. I can't get over the amount of energy included in the way Joe Elliott spits out the word "Anger," splitting it in two syllables and creating such a powerful emotion that the song becomes an excellent fit for Khaled in chapter eighteen, specifically in that scene where he sits on his bed, hands over his ears, as his bedroom door shakes under his father's blows. "Deliver Me" also discarded one of the lines that fit that scene perfectly well: "Living in your shadow's got me crawling the wall." So, with my apologies to Def Leppard and to my former students, "Anger" it shall be. This is my ultimate go to song when I'm, well, worried. While I can't really buy into a song unless I love the lyrics, this particular song also boasts one of the most beautiful guitar solos I know of. It's the perfect marriage of words and music, where both work together to create a most soothing effect. While the lyrics are clearly from a man to his loved one, I'm going to bend the rules here and choose to make that song more universally applicable to several relationships in the novel: it could very well be from Brittany to Khaled or the other way around; it could also be from Ehsan to Khaled, or from Ameena to Nagla, or from Ehsan to Nagla. The idea of trying to bring comfort to someone sick with worry is the core of this song and makes it so suitable to several characters in the novel. Khaled, in the novel's climax, thinks about learning to fly—and I didn't even have this song in mind when I wrote that scene. Having said that, I'm sure I had internalized this song after years of listening to it, so maybe I did subconsciously think of Pink Floyd as I wrote that scene? Possible. But, regardless of the scene's genesis, this is the ultimate song for Khaled, both for the lyrics and the music that, as is always the case with Pink Floyd, is exquisite. Favorite line: "Tongue-tied twisted just an earth-bound misfit, I." I had to include at least one Egyptian song on this list, and, when picking just one person to represent Egyptian music, Om Kalthoum has to be the ultimate candidate. From the 1940s till the 1970s Om Kalthoum, who is arguably the most beloved singer in Arab history, gave many concerts, always on the first Thursday of the month. The concerts were aired live, and people used to gather by their radio sets and listen to her sing for two hours or more—a time she usually filled up with only one or two songs. Her songs are still popular in Egypt today, even though Egyptian music has changed vastly in the last few decades. The song embedded below is one of her most popular ones. "Enta Omry" (You are my life) is a romantic song that, yes, runs one hour and 18 minutes in that particular recording. She doesn't start singing till the 11:53 mark, but listening from there till the 15:00 mark will give you a good idea of the range and power of her voice. Also note her signature crescent-shaped diamond brooch as well as the handkerchief, another signature item. If Ehsan listened to anything other than the recordings of the Qur'an, she would listen to Om Kalthoum. Her voice is also the one playing in Lola's car when she picks Samir and Nagla up from the airport upon their arrival to the U.S. in 1985. Listening to her could, perhaps, offer a glimpse into the culture Samir and Nagla left behind and help explain why the transition was not an easy one for them.